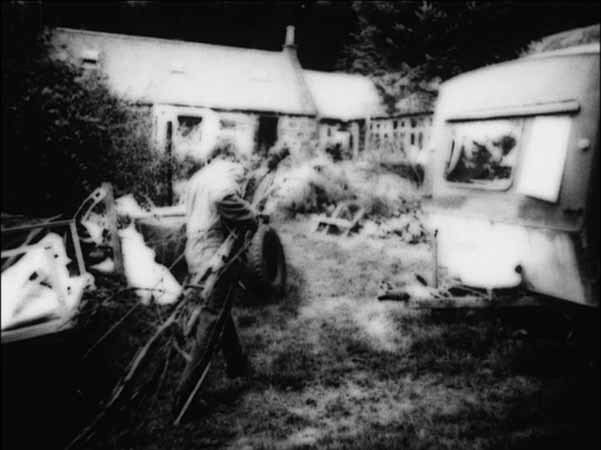 A hand-processed portrait of Jake Williams – who lives alone within miles of forest in Aberdeenshire, Scotland. Jake always has many jobs on at any one time, finds a use for everything, is an expert mandolin player, and has compost heaps going back many years. He has a different sense of time to most people in the 21st Century, which is explicitly expressed in his idea for creating hedges by putting up bird feeders. It struck me straight away that there were parallels between our ways of working - I have tried to be as self-reliant as possible and be apart from the idea of industry - Jake's life and garden are much the same - he can sustain himself from what he grows and so needs little from others. To Jake this isn’t about nostalgia for some treasured pre-electric past, but more, a very real future.